The Afghan hound, known for its long, silky coat, is a breed of dog popular for its show-worthy qualities. Afghan hounds are considered one of nine ancient or “basal” breeds, meaning their DNA is more closely related to the dogs of ancient history than common contemporary breeds. Though the breed originated in Afghanistan (where the breed name was Tazi), most of today’s Afghan hounds are thought to have originated in early 20th century Great Britain. In addition to their striking appearance, Afghan hounds are known for their independence and self-confidence, as well as their sweet, fairly quiet, and humorous nature around humans they are comfortable with. Coat and Color: Coat is long, thick, and fine and can be any color or combination of colors, including brindle and domino. The Afghan hound, considered by some to be the oldest of all purebred dogs, originated in Afghanistan. It is hard to pin down exactly when the Afghan first appeared, as its presence predates written history; however one of the first published descriptions of the breed appeared in a drawing by English soldier Thomas Duer Broughton when he was in India in 1809. Afghans can be traced back to several regions in Afghanistan, with distinct differences in their coat and color depending on where they are from. Afghan hounds from mountainous areas have thick and dark coats while those from the desert have coats that are lighter in color and volume. For centuries, they have served as hunting companions for humans, who rely on them for their speed, quick and independent thinking, and panoramic vision—common traits of all sighthounds. Today’s Afghans are primarily the result of breeding efforts made by the English in the 1920s. The breed had become a mainstay of British soldiers and noblemen in the early 1900s but almost died out during World War I, when resources shifted and it became difficult to breed and care for companion animals. In the mid-1920s, British military officers began bringing Afghan hounds to the West, and in 1927, the breed was registered by the American Kennel Club (AKC). By the 1980s, Afghan hounds in America had become mainstays of the show-dog and obedience circuits. Due to their long coats, grooming is an essential part of an Afghan's care. Its fine and silky coat must be brushed regularly to prevent mats and tangles, though baths are only required as necessary. Brush an Afghan hound’s coat multiple times per week to maintain its silky texture and reduce shedding. Aside from frequent brushings, Afghan hound grooming requirements are relatively basic. Nails should be trimmed as needed and proper dental care provided on a regular basis. 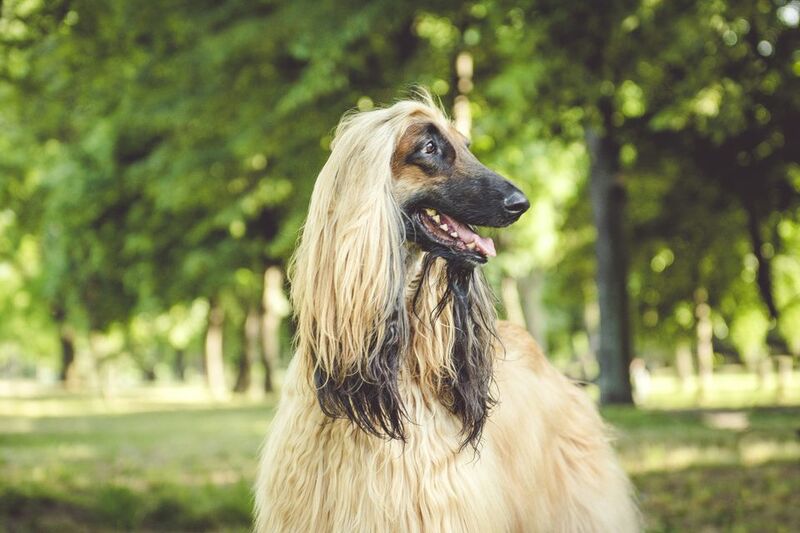 Long hair around their ears means that Afghan hounds are often prone to ear infections, so ears must be kept clean and checked regularly for signs of irritation or infection. Many Afghan owners tie the hair on their dog’s head up in a top knot to prevent it from getting into their food or trapping bacteria around their ears. Afghans need daily exercise, but they are often happy to settle in on the couch with their humans after they have had a chance to run around. Daily walks or runs are encouraged, as are activities that make use of the Afghan's natural hunting drive, such as lure coursing. It is also recommended that the Afghan has a chance to run off-leash in an enclosed area once or twice a week. Although they are known for their smarts, Afghan hounds can be aloof and stubborn when it comes to training. Unless the goal is to train for shows, obedience, or sport, most Afghan owners find it sufficient to stick to the basics of household training. Keep in mind that because their hunting drive is one of their strongest features, even the best trained Afghan hound may still refuse to listen to “stay” or “come” if they are on the pursuit of prey. Like all dogs, Afghan hounds do best on a diet of high-quality, protein-heavy food. Adult Afghans should eat about two to two and a half cups of dry food a day divided into two meals, though dry food can be supplemented in part or entirely by wet food. Afghan puppies, seniors, and those experiencing injury or illness have different nutrition needs, so it’s important to get clear directions from a qualified vet when determining their diet. Limit food and increase exercise for adult Afghan hounds that are overweight. All dogs are unique, but you can tell a lot about what you might be able to expect about a dog’s personality from their breed. For more information, check out all of our other dog breed profiles.